Friends, I did it again. And there’s no one but myself to blame. I chose this dark path, thinking things would be different this time. After all, it started innocently enough. I was simply looking for an original pumpkin dessert. It’s a harder task than it seems. Most recipes combine pumpkin with caramel, cream cheese, cinnamon, apples – you get the idea. They’re similar. So when I came across this Pumpkin Spiced Cake with Chocolate Snickers Ganache it was like finding a rare gem. Sure I’d seen pumpkin and chocolate desserts before. But never pumpkin with chocolate, AND a candy bar. I had to try it. Even though last week showed me how dangerous candy bar creations could be. Besides, the author said the pumpkin cake wasn’t too sweet, and balanced the Snickers and caramel drizzle… Oh, yeah. There’s a little caramel too. I stuck to the recipe except for the following. It’s intended to be a bundt cake. My sanity may be questionable. However, I still had enough to half the ingredients and downsize to a 9″ round pan. I didn’t have allspice or mace, and I have no intentions of buying either. I just substituted Trader Joe’s pumpkin spice (it includes the traditional blend, along with lemon peel and cardamom). Alternating additions of the flour mixture with a wet ingredient doesn’t always work for me. I might end up overmixing. Rather than take any chances, I mixed in the pumpkin purée after the vanilla. Then, I stirred in the flour mixture by separating into three additions. I chopped eight fun-size Snickers instead of using regular ones. At the time, having extra chocolate candy seemed like a bonus. Now, I’m not so sure. My cake pan was dark coated, so I lowered the oven temp to 325 degrees. Baking time was 30 minutes, half the time advised for the bundt. While the pumpkin cake cooled, I prepared the ganache. Made only of semi-sweet chocolate and heavy cream, the outcome was dark chocolate. There was no hesitation pouring the ganache over the cake. In fact, I enjoyed watching chocolate pool on the sides. However, when I began arranging the Snickers on top, my lapse in judgment became clear. I was exactly where I was a week ago – staring down at an evil I brought upon myself. 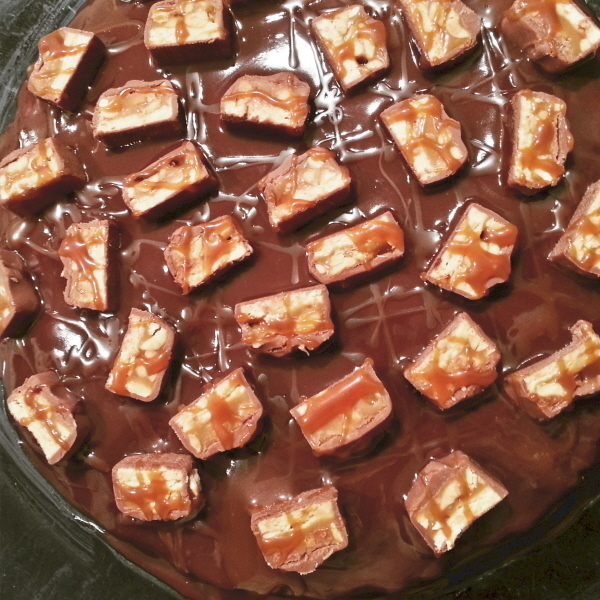 I considered omitting the caramel drizzle to improve my situation; but it was there to sweeten the ganache. So I used less than two tablespoons as a compromise. I cut a smallish slice for my first sample, managing to leave any Snickers chunks intact. I was impressed with the pumpkin cake from the start. While the volume was dense enough for a bundt cake, it was soft, moist, and perfectly spiced. Paired with dark chocolate ganache, the flavor was okay. Perhaps milk chocolate would’ve tasted better. Though mouthfuls with the Snickers and caramel did have a satisfying chew. Truthfully, I was uncertain about my rating after that first sample. Maybe the combination was too unusual. But then, something remarkable happened in the fridge overnight. The caramel merged with the dark chocolate ganache, and the ganache firmed over a more flavorful cake. Decadent and delicious, I savored the result. Admittedly, I was no longer upset with myself. Still, I decided no more crazy, candy bar desserts for a while. 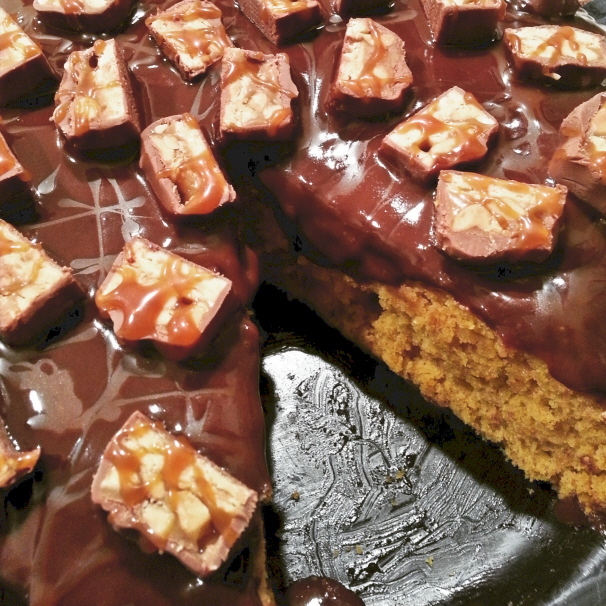 I give this Pumpkin Cake with Chocolate Snickers Ganache 4 out of 5 stars. Actually, 4.25 if I believed in such increments. It’s a delectable way to indulge your pumpkin passion and use leftover Halloween candy. For the full recipe, please visit Frugal Mom Eh! Oh gosh, how yummy-yummy! Thanks for sharing the recipe. We wish you a ghostly great Halloween! My pleasure! Enjoy and have a Happy Halloween!